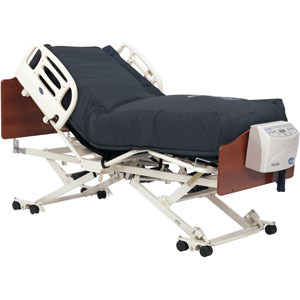 80" x 36" x 10"
Lateral rotation mattress includes patented z-cell subtle turning motion. Additional therapies include alternating pressure and on-demand low air loss to keep the environment temperate and help wick away moisture. Therapeutic Support Surface model is an advanced mattress enhanced with patented features to create the ultimate patient comfort and relief. Using a compressor system, the MA90Z mattress offers alternating lateral rotation and on demand low air loss to help provide pressure relief and moisture management for up to stage IV pressure ulcers. State of the art compressor allows for easy set up and effective therapy cycles. Powerful blower provides greater air output, quick set up and more efficient therapy cycles. When the transmitter in the head section is raised, 25% more air is automatically added into the mattress, helping prevent the patient from bottoming out.